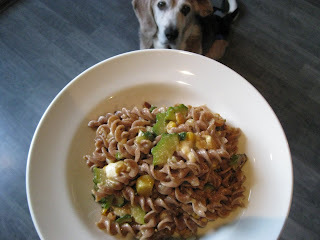 Continuing to work through the supplies on hand, tonight's dinner consumes frozen corn kernels, garlic, rye pasta and feta we had on hand, plus zucchini and baby shallots from this week's box. Wrap corn in foil and roast in preheated oven for about 1 hour. This can be done in advance on a prep day. Cook rotelle according to package directions. Drain and reserve 1 cup of the cooking water. Transfer pasta to a large bowl. Meanwhile, heat oil in a large skillet over medium heat. Add corn cut from cob, zucchini and onion and saute for 3 minutes, until golden brown. Add oregano and cook 1 minute. Add broth and roasted garlic and bring to a simmer. Simmer 5 minutes. Pour mixture over pasta and toss to combine, adding cooking water, if necessary, to moisten pasta. Fold in parsley and season, to taste, with salt and black pepper. Transfer pasta to a serving platter and top with feta cheese. Frozen corn kernels, roasted, in place of fresh corn. Vegetable stock for chicken stock. Baby shallots in place of red onions. A note on the rye pasta. It does not taste like the typical rye loaf of bread, which normally includes caraway seeds. It is "grainy" however, so not for everyone. The dish tasted like something you'd find at Calafia or Greens - great flavor and obvious nutrition. If you are making this for a non-veg crowd, I'd substitute white pasta for the rye and might pair with grilled fish or chicken. A to Z Pinot Gris would be an excellent, moderately priced wine choice.